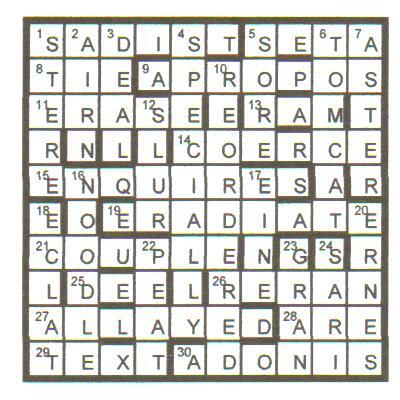 It’s a carte blanche puzzle, with one letter to be removed from a word in each row and each column (and moved to the margin), just to make things a bit more difficult. At least all the grid entries are real words. So let’s get started. I have to confess that I’m no great shakes at cold solving. 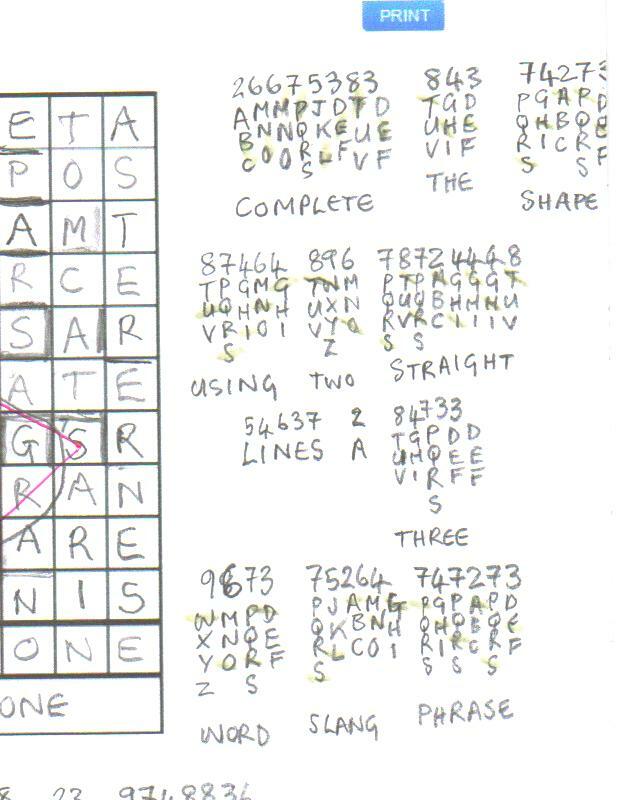 A first pass through the clues yields only five answers: COERCED (from which the only letter that can be removed is the D, leaving COERCE); EASTER (which could yield ASTER, EASER, EATER, ESTER); BAIRN (⇒ AIRN, BAIN, BARN, or BIRN)*; SARIN (⇒ SAIN, SARI); PLEAT (⇒ LEAT, PEAT, PLAT, PLEA). * I might have been able to make faster progress had I checked all these words in Chambers , since this dictionary is lacking BAIN ( OED : “A quantity of water or other liquid placed in a suitable receptacle, in which one may bathe”) and BIRN ( OED : “The portion of a clarionet or similar musical instrument into which the mouth-piece is inserted”). By good fortune all the deletions from EASTER yield _ _ _ER, and it looks as though it’s possible that COERCE intersects with the E. With nothing else to go on, let’s guess that this is right, and put in as many bars as I can deduce from the answer lengths. It seems likely that the long down answers cross through the C and O of COERCE, and sure enough, they are ESPECIALLY (⇒ SPECIALLY) and PREORDERED (⇒ REORDERED), and this make it possible to get the long across answers, ENQUIRIES (⇒ ENQUIRES) and ERADICATE (⇒ ERADIATE). The digraph QE in column 3 looks very unlikely, so I put in bars around the Q. I solve a few more clues: COUPLET (⇒ COUPLE), TOMCAT, APROPOS, NOODLE (which has a very nice triple clue, “Simpleton spent dole on some pasta”). There’s four-letter down clue (“Greenish, endlessly twitching, eyes”), that from its position in the list of clues (comes after NOODLE but before the last two five-letter clues), I can deduce must have its first letter on row 5. So it’s either URP_ or EI_ _. It’s EINE (“Greenish endlessly” = EENI and “twitching” is the anagram indicator). And the symmetric answer is SLUR. Putting in SLUR and EINE forces some more bars. Because no letters were removed from either SLUR or EINE, there must be other words in columns 4 and 7 (so that some letters can be removed from these columns), and that means there can’t be a four-letter word at the top of column 8 (because there aren’t enough clues to have a four-letter word at the tops of both columns 7 and 8). Then I make a mistake. Somehow I’ve decided that there’s a three-letter answer on row 4, to the left of COERCE, so that on row 3 there’s a five-letter answer on its own. This allows me to put some more bars in. Wrongly. Next I get REAM (⇒ RAM, REM) and since this lacks an L it can’t intersect with SLUR. So I can put more bars in, but this leaves the grid rather poorly connected. Surely a respectable setter like Xanthippe wouldn’t set a grid like this? It’s beginning to look as though I have gone wrong. 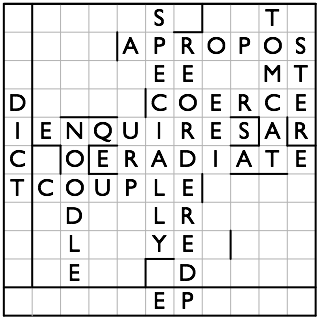 The thematic word at the left of the grid is _ _[EA]DICT_ _ _ which looks like it could be PREDICTION or PREDICTIVE. I wonder if the theme is PREDICTIVE TEXT? Yes, TEXT goes at the lower left (“Tense UK retailer shunning new lines”). 9673 75264 747273 6878 23 9748836 86337 843 4743. WORD SLANG PHRASE MUST BE WRITTEN UNDER THE GRID. The slang phrase must be DOG AND BONE, with the lines we’re instructed to draw forming a picture of the BONE. So could the other thematic entry be MOBILE PHONE? That fits with BAIRN (⇒ AIRN), EASTER (⇒ ASTER), PLEAT (⇒ PEAT) and SARIN (⇒ SARI). That’s good enough for me, let’s fill it all in. 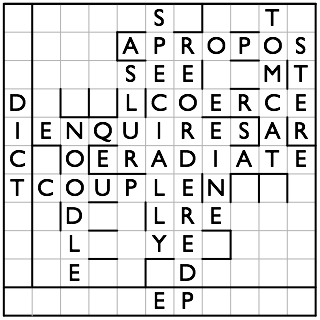 I find it can be a bit of a slog when I’ve worked out the code and the theme and know what I have to do, but I still have big blank areas of the grid, knowing that the remaining clues are the most difficult ones. But duty calls: back to the grindstone. ECLAT appears for the second time in today’s Times : it was also in crossword 24,430. SADIST seems quite sadistic, using two obsolete words, “no longer save” = SA and “old poem” = DIT. “Judge acquitting Frenchman after one French impression” eventually yields IDEE (⇒ DEE) after much thought. I think it’s “judge” = DEEM, “acquitting” = removing, “Frenchman” = M, “one” = I, and “French impression” = IDEE. “Guide with base moved down on printer’s plate” must be STEREO (⇒ STERE). I get “printer’s plate” (short for STEREOTYPE) but the wordplay eludes me for a long time. Eventually I figure it’s “guide” = STEER, “base” = E, “on” = O. But one of the clues is beyond me. “Prop primarily supporting one edge of hide” must be SHORE (⇒ SORE). “Prop” = SHORE, “primarily supporting” = S, but how does “one edge of hide” = HORE? Someone, throw me a bone here. Rule number one with a Listener is: “Read the preamble, and then read it again”! You can then start the puzzle, but only after you’ve read the preamble for a third time! The picture was obviously meant to resemble a mobile phone … wasn’t it? 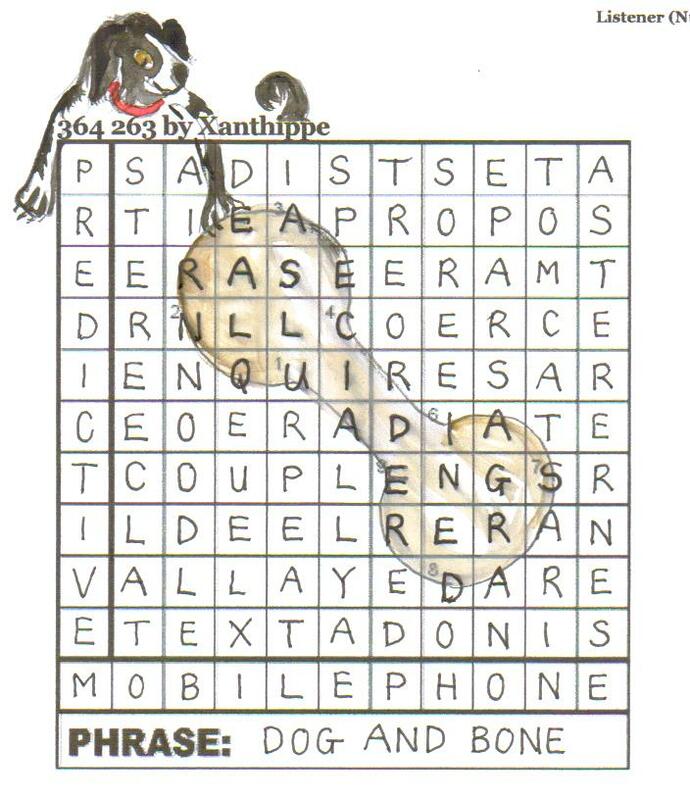 Luckily it wasn’t long before I looked at the title for the third time, which decodes to “Dog and”, giving the phrase to be entered under the grid as DOG AND BONE, and a simple picture of a bone to be drawn in the diagram. Commiserations to any non-British solvers who had problems with ‘Dog and Bone’, Cockney rhyming slang for ‘telephone’. They would likewise probably have wondered about Next being a UK retailer! Of course, any Americans out there are also probably perplexed by ‘mobile’, as opposed to ‘cell’ (how unromantic). Apparently the Germans call it a ‘handy’. My final task was to sort out the clue Prop primarily supporting one edge of hide? I have a rule now that I don’t send an entry in until the wordplays in all clues have been fully resolved; I put GASPS a couple of years back when it should have been GASPY. The answer here was obviously SHORE, and primarily supporting was almost certainly the S. It must have taken half a dozen visits to the clue before I saw that one end of hide was ‘h or e‘! A good puzzle from Xanthippe whom I’ve just about forgiven for somehow tripping me up in week 3 of 2008 with the Solitaire puzzle … week THREE! This was a nice simple theme with lots of little strands coming together neatly at the end. 364 263 by Xanthippe, Dog Bod! Friday at 16.00 heard the usual groan from the Stripey Horse Z?? ?A (5) team. ‘Not another with no numbers and no bars!’ However, for once, we read the preamble carefully and there were two optimistic signs. 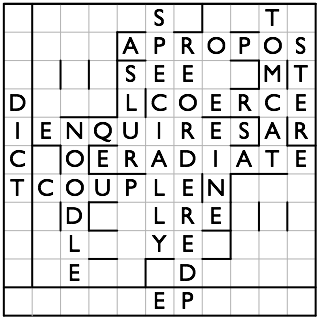 ‘All grid entries are real words’ and ‘the 10 x 10 sub-grid has 180-degree rotational symmetry’. The code looked even more promising with an isolated 2. That must be A! Is it possible that we are dealing with the keyboard of a mobile phone? We shelved that till later and set to with the solving. TIER, A-PROPOS, ERADICATE, ENQUIRIES, ESPECIALLY, TOMCAT, SLUR, NOODLE, IDEAL and PREORDERED fell into place. This was far more approachable clueing than we have been favoured with in the last few Listeners. 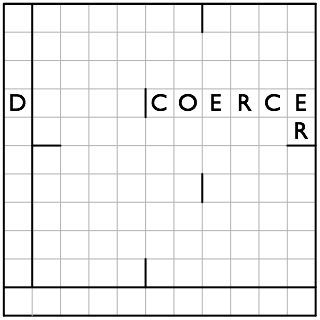 ‘Bars and numbers should not be entered.’ However, when we constructed a grid with bars, the rest simply fell into place. Clearly, the long 8 and 9-letter words were crossing the centre; this fixed the shorter words and gave us a few more ALLAYED, EASTER, COERCE and RERAN. 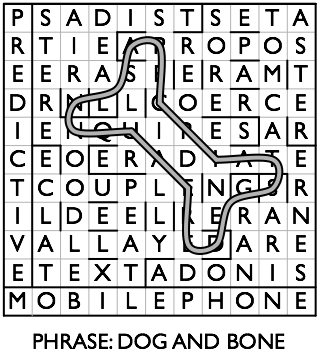 Deciding which letters needed to fall to the bottom of the grid or leap to the left side was fairly straight-forward, too and MOBILE PHONE and PREDICTIVE appeared. We had been struggling with the clue, ‘Tense UK retailer shunning new lines (4)’ for a while but realized (with a rather curmudgeonly grumble) that this was a reference to the fashion house NEXT who had to ‘shun new’ and get a T from ‘tense’ – and so we had TEXT. Predictive text – Oh dear, I hate the way it proposes all sorts of silly things I never intend to say and, with a great struggle, have managed to bury it among the buttons on my loathed mobile phone. Do I honestly have to resurrect it? I decided not, and, as the dog’s body of the team, laboriously worked out the message by writing down all the possible letters – quite a rewarding task – though long! So we had to ‘Join centres of consecutively numbered cells with curves and complete the shape using two straight lines. A three-word slang phrase must be written’. The shape that appeared looked vaguely like a fashionable mobile phone but it had to be a bone, so the DOG BOD of the title must be DOG AND – Cockney rhyming slang. How nicely that tied it all together. All that remained was to fill our remaining gaps. What, no red herrings? Of course, we had. DOUBLET had seemed to be a fine solution for ‘Twin left in sporty car — old Ford Model (6). We hadn’t taken a fine tooth comb to the wordplay and removing a T produced DOUBLE. Of course, that meant that we couldn’t fit in P(L)eat. We seemed to have fallen at the last fence until COUPLE(T) resolved the problem (though the definition doesn’t really seem to fit). SADIST, too, escaped us for a while. Clearly, the cruel person was a sadist, but I needed a night’s sleep before SA’ + DIT, taking in S fell into place. All-in-all, though, this was not a difficult solve, even for our limited abilities, its bark was worse than its bite. That is important, we think. There must be some Listener crosswords that are accessible to teams like ours. I did have an excuse for getting out the coloured pencils again, too. Thank you Xanthippe! So here we are with the first puzzle of a brand new year … a clean sheet as it were, for an all-correct run. Fifty-two puzzles lie ahead, and what a challenge it is again to try and achieve 100%. First on the list is Mr E, the setter whose golf puzzle from last year was quite a struggle. Part of me hopes that this will be equally enthralling, but without the chance of a silly slip-up at the first hurdle. A quick read of the preamble, and it’s just the sort I like … almost incomprehensible! 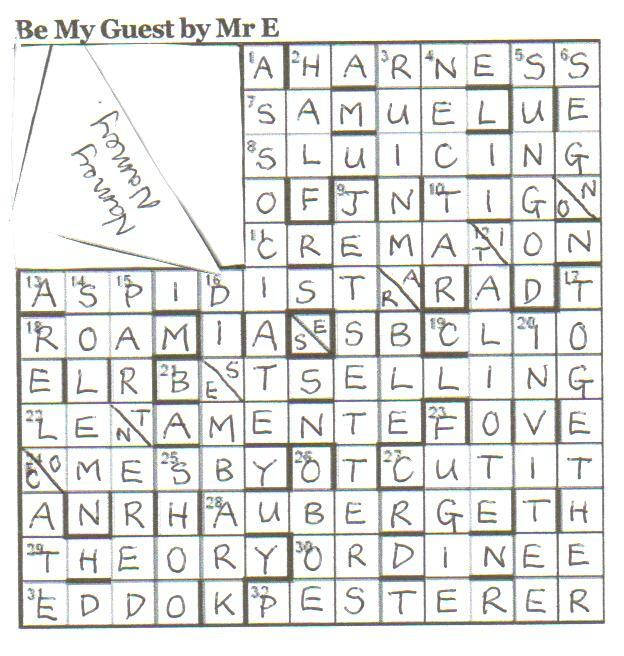 Two answers, X and Y, plus nine other words spelt out by the initials of extra words in clues, give instructions on what to do once the puzzle is completed. 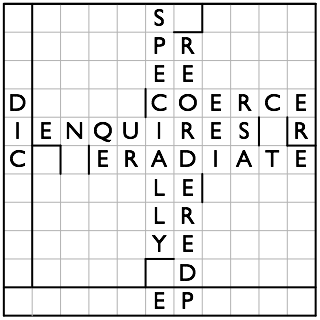 The grid itself has a large square instead of the 5×5 block in the top left corner; at least that means there aren’t as many clues to solve as would be normal in a 13×13 grid. As with many Listener puzzles, the best thing is to start solving and hope that it all comes out in the wash.
ROAM at 18ac and SOLEMN at 14dn give me a good start and enable me to complete the lower left section of the puzzle fairly quickly with ASPIDISTRA, PARTNERED and LENTAMENTE, each requiring two letters to be entered into one of their squares which are to be split in two, like the central one. I’m thinking that these diagonally split squares must represent something to do with the theme, and I wouldn’t be surprised if the large square needs to be similarly divided. Nothing immediately springs to mind though. BEST-SELLING leads me to string the first three of the double squares together, and a leaf through Chambers reveals CONTESSERATION. This is the dividing of a square tablet in two to form a friendship. So everything’s coming together nicely. The last few clues take a bit of time: HALF, the other clue without an extra word, [FLASH (like a criminal) – S reversed, gives HALF meaning imperfectly]; and ASSOCIATE (AS + SO + A in CITÉ, although I think this deserved something stronger than a ? ); and SEGNO which needs reversing with SP (for spelling) on the front to give sponges (sots). The initials of the extra letters reveal OUT IN KEEP ENCLOSE WITH YOUR NAME ON IT. The full instructions are finally revealed as CUT IT OUT. CUT IT IN HALF. KEEP HALF. ENCLOSE HALF WITH YOUR NAME ON IT. Which is precisely what I did, and again felt sorry for John Green having to store all the odd bits of paper that Listener puzzles are degenerating into! All in all, bloody marvellous, and another puzzle where you’ve got to ask yourself “Where the hell did he get the idea from??! !” Keep ’em coming, Mr E.
I have completely forgotten to check the last four entries for last year, but Mr Postman delivered something this morning that means I don’t actually need to! There was a fair chance that this was going to be a blogless week for the Easy-clues-stripey-horse-Z???? (5) team. Did I hear a groan of relief from the experts who despair of our floundering bungled solves? After the usual hours of desperate staring at Mr E’s odd grid with the blank corner square, our early solutions took us nowhere. Why? Clearly, since clues were going to yield words that were sometimes longer than the number of cells, and ‘two letters separated by a diagonal line must therefore be entered in some cell’ (did he mean cells? Was this a Listener misprint?) we had to spot across and down clues that shared a couple of letters. ASPIDISTRA and DISEMBARK seemed to be a fine pair of culprits and a few other pairs appeared – and we had dug ourselves into a fine hole. Obviously we were on the fast track to failure. The south-east corner of the grid filled easily with straight-forward clues like ‘Purple (coat) missing in inn’ (AUBERGE). (For once, our other language didn’t work against us.) ‘Who will bother the queen about measure by (eastern) prince’ PESTERER , INVITEE, ORDINEE, TOGETHER and FUGIE but nothing would fit around our slashed cells. Expert solvers will probably find it impossible to believe that we could be so blind to the obvious. It took our wise friend to prompt us to read the preamble more carefully. (New Year resolution stuck on the mirror READ THE LISTENER PREAMBLE MORE CAREFULLY!) Of course, there was a reason for those details, ‘both letters in a double cell from part of both the across and down answers intersecting at that cell, when read in the encountered order‘ So that was why the line had to be diagonal! As soon as we understood that the letters were read in one order for the down clues and the other for the across clues, the grid-fill became easy. CONTESSERATION emerged in a lovely upward-slanting line of double cells – ah, the joys of ignorance – Chambers explained that and all was clear. Even the message emerged, ‘Cut it out, cut it in Y, keep Y, enclose Y with your name on it’. With backward easy-clues team logic, we understood that our missing solution at 2d ‘Without a bit of stealth, like criminals raised imperfectly’ (4) had to be HALF and the wordplay was explained to us – FLASH (slang for criminal) upwards, without S (a bit of stealth). At one stage Mr Math muttered, ‘If Mr E really wants to contesserate with lots of new friends, he should make his clues easier! We dabbled with the idea of cutting the entire grid in half diagonally and sending a queer triangle of words, but, in the end, neatly chopped out that tessera and are carefully looking after Mr E’s part. After last week’s birds and this week’s holey grid, we are fearful of what lies in store next week. Thank you, Mr E, for what, in the end, was a very rewarding solve.